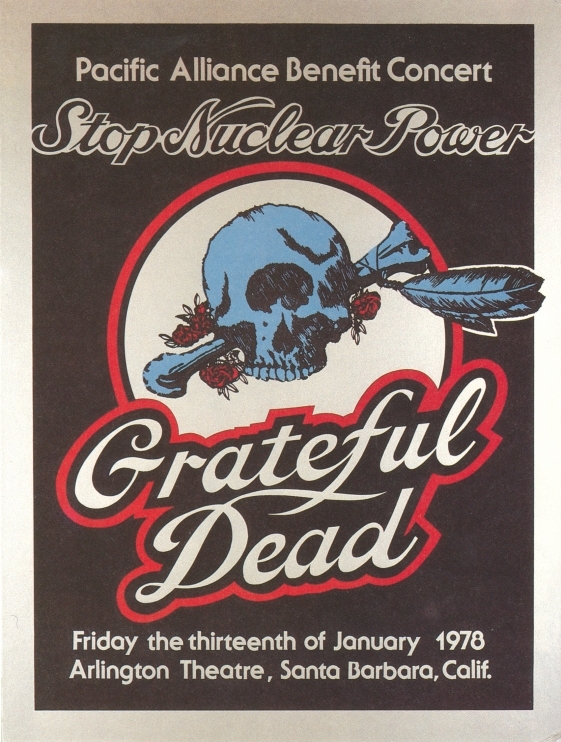 The anti-nuclear movement has been revived by the recent catastrophe in Japan, “putting governments on the defensive and undermining the nuclear power industry’s recent renaissance,” according to the Washington Post.1 Menus from dinners held backstage at two anti-nuclear benefit concerts on the West Coast during the 1970s recall an early phase of the movement. 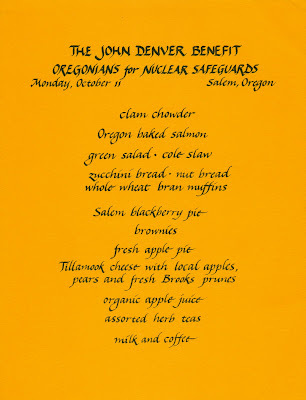 Although the efforts opposing the use of nuclear technologies have been ongoing, one of the ideas about food reflected on these menus has already entered the mainstream of American society. 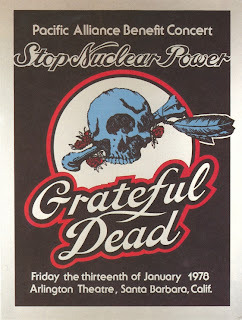 The menu below, simply marked “no nukes,” survives from a Grateful Dead concert for the Pacific Alliance, a non-profit organization dedicated to stopping the proliferation of nuclear power. This event was held at the Arlington Theatre in Santa Barbara, California in January 1978. Working to help produce such concerts and prepare meals for the musicians and crew, journalist Vicki Leon often made menus and quick-printed copies for the performers.2 Some of the meals at these benefit concerts (there were a number of them during this period) were prepared at the homes of the no-nuke supporters, while others were cooked backstage, using on an array of electric frying pans. The Spanish-inspired dish called “chicken fizz” was made by sauteing garlic, onion, and slices of chicken breast, and then simmering in a seasoned broth with sour cream, chopped jalapenos, and a good dollop of dry fino sherry. 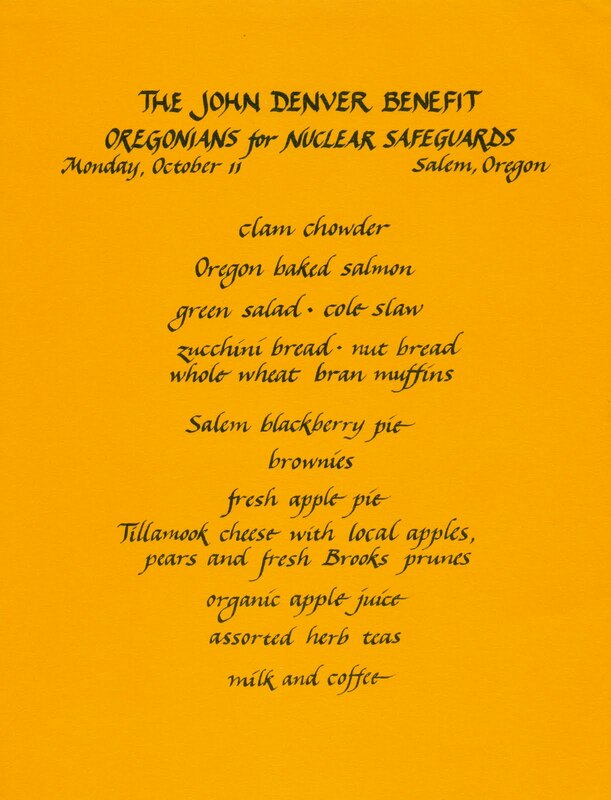 The menu shown below is from a John Denver concert in October 1976, given for the benefit of the Oregonians for Nuclear Safeguards. This dinner was served in the wings of the Armory in Salem. Other than the brownies, an extra-special treat for the baby-boomer generation, the bill of fare features mostly healthy foods like zucchini bread, whole wheat bran muffins, and organic apple juice. While organically-grown foods were not yet widely accepted, they were prevalent in many groups of the counterculture. 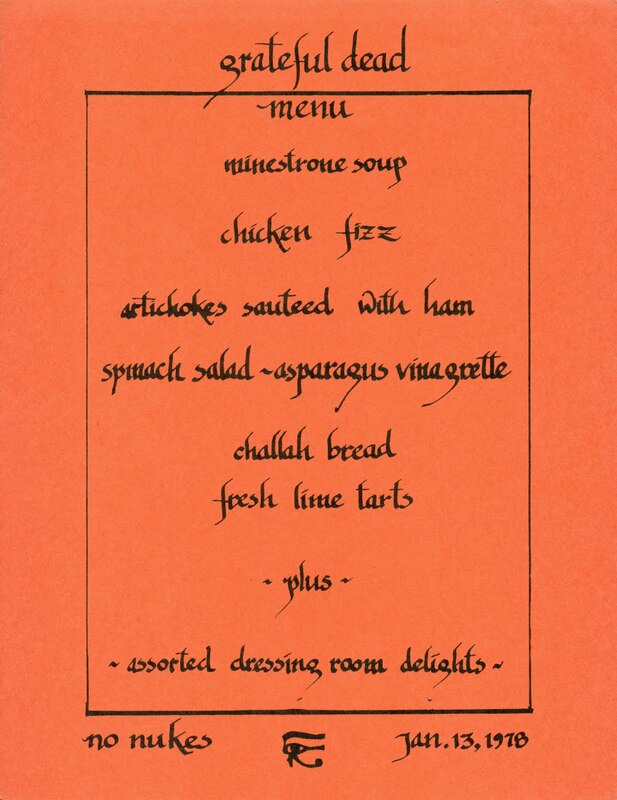 What is surprisingly prescient about this menu is its emphasis on local foods, reflected by dishes like Oregon baked salmon, Salem blackberry pie, and Tillanook cheese. Brooks prunes were made with plums grown just eight miles north of town. Resisting industrialized and processed foods, this dinner reflects the current philosophy of having a connection to your food source, almost three decades before the word “locavore” was coined. In that sense, it was ahead of its time, begging the question as to whether the central tenets of these fundraisers will again enter the national debate. 1. Washington Post, 16 March 2011. 2. My thanks to Vicki Leon for graciously providing her recollections of these events. 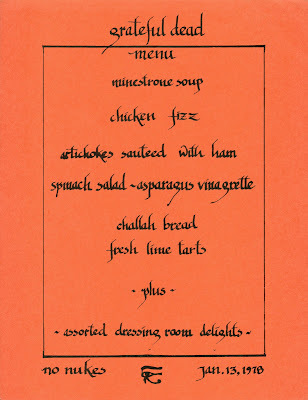 What interesting menus...they are chronicles of such a 'groovy' time. Excellent that they were already thinking local... and bragging about their local food. The dishes all look amazing... I especially have my eye on that chicken fizz. I can actually say I cooked for a Dead member... we were all helping a mutual friend do a commercial... I volunteered to do the catering. He liked my green sauce and I gave him the recipe in the early 90's. Loved this post! How far off the recent past seems!